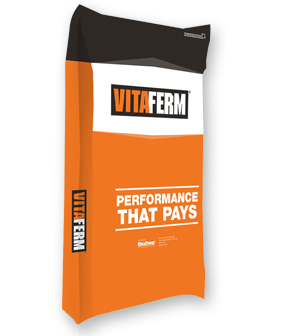 Provides a highly palatable pellet that encourages calves to come to the bunk. Contains high levels of vitamin E, niacin and thiamine, as well as organic zinc, copper and manganese combined with a double dose of the Amaferm® advantage, providing a smooth transition during the most stressful time in a calf’s life. Amaferm® is a precision prebiotic designed to enhance digestibility by amplifying nutrient supply for maximum performance. It is research-proven to help calves adjust rapidly, gain faster and stay healthier. Wheat Middlings, Corn Gluten Feed, Calcium Carbonate, Soybean Meal, Potassium Chloride, Salt, Ground Extruded Whole Soybeans, Cottonseed Meal, Monocalcium Phosphate, Dicalcium Phosphate, Zinc Proteinate, Dried Aspergillus oryzae Fermentation Product, Manganese Proteinate, Dried Cane Molasses, Zinc Sulfate, Manganese Sulfate, Copper Sulfate, Sodium Selenite, Ethylenediamine Dihydroiodide, Cobalt Carbonate, Niacin Supplement, Copper Proteinate, Lignin Sulfonate, Vitamin E Supplement, Selenium Yeast, Propionic Acid (a preservative), Vitamin A Supplement, Vitamin D-3 Supplement, Natural and Artificial Flavor, d-Calcium Pantothenate, Riboflavin, Vitamin B-12 Supplement, Thiamine Mononitrate. Feed to beef cattle at the rate of 0.5 lb. per head, per day for the first 14-28 days.